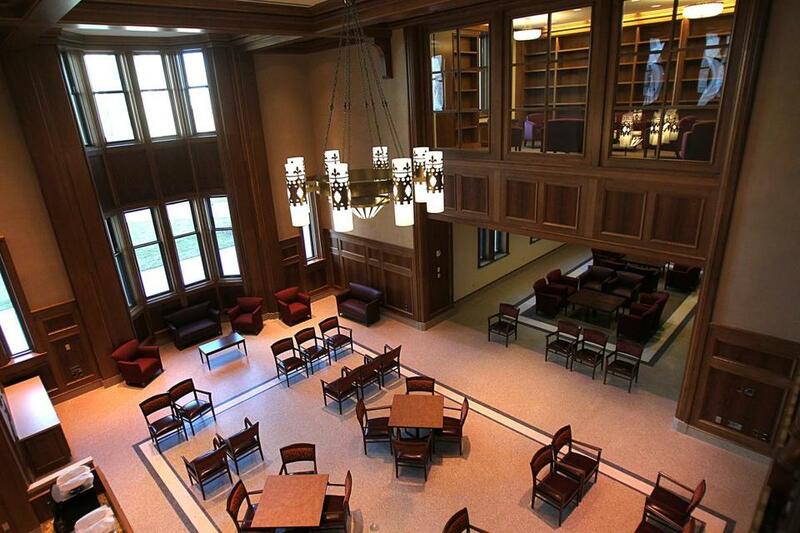 BC’s new hall is the school’s most expensive educational building. The lounge is pictured. For the first time in 45 years, Boston College will soon open a new academic facility on the main part of its Chestnut Hill campus. BC officials say that the $78 million Stokes Hall, the school’s most expensive educational building ­ever, represents an investment in the humanities and a bet in the ­future of bricks-and-mortar higher education. It is opening as many insti­tutions, students, and families are questioning the value of liberal arts studies in a struggling economy and amid the soaring cost of college. The building’s namesake, Patrick T. Stokes, who has ­donated $22 million toward the facility, earned a degree in math from BC in 1964. Professors were scheduled to move into Stokes Hall on Wednesday, and the first classes will be held there when students return from winter break. 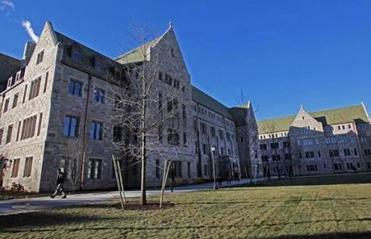 It will be the second-largest educational building at BC, ­after Higgins Hall. The college broke ground on the 183,000-square-foot, L-shaped Stokes Hall two years ago on what was the last substantial undeveloped site in the central part of campus. On a recent visit to the new building, workers were rolling out sod for a new Campus Green and putting finishing touches on the 36 new classrooms, common areas, an honors library, outdoor plaza, and amphitheater. Despite its size, the building is rather inconspicuous. The architect, Tsoi/Kobus & Associates, designed Stokes Hall to match the English Collegiate Gothic Style of the historic buildings in that part of campus, including the school’s flagship facility Gasson Hall, which turns 100 in 2013. “The biggest compliment we get from everyone is it looks like it’s always been there,” said Patrick Keating, executive vice president of BC. Still, many upperclassmen and alumni have missed what used to be on the site: the main quad. The site housed BC’s first football field until Alumni Stadium opened in 1957. The space then became popular for student recreation. Foot traffic, wind, and cold winters killed much of the grass and students dubbed the spot the Dustbowl, a name that stuck long after the school ­replanted the lawn. The space has been inaccessible since construction of Stokes Hall began on Oct. 4, 2010. One night before the work started, students held a vigil. Senior Taylour Kumpf was among those who gathered. “A lot of students were really upset that they lost that amount of green space,” said the 21-year-old, who is now editor in chief of the student-run newspaper, The Heights, and who also works as a campus tour guide. But college officials say most of the area that the school calls the Campus Green is returning now that the building is finished.